The beginning of the Festive Season saw me launch Debbie Bliss Originals, knitting patterns downloadable from my website. I’ve kicked off with knitted toys, and can honestly say, I can’t remember when I last had so much fun! 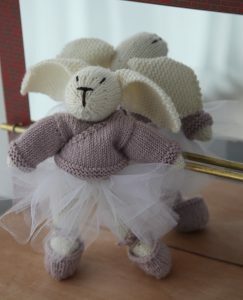 Making the rabbits and their tiny garments and then on the photo shoots where we all agreed rabbits were so easy to work with. They turn up on time, have very few tantrums and are happy with a green salad. Nutcracker Rabbit warming up for photo shoot. Debbie Bliss Originals. 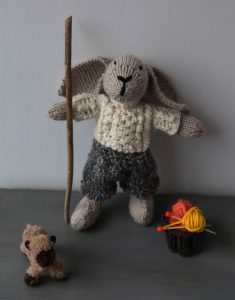 A Box of Christmas Bunnies was the first pattern to be launched, followed by Rustic Ralph, the Country Rabbit. We have loved recording all their adventures on social media too. As you will see, Ralph in particular got into some sticky situations on his recent day trip to London. Rustic Ralph the Country Rabbit. Debbie Bliss Originals. 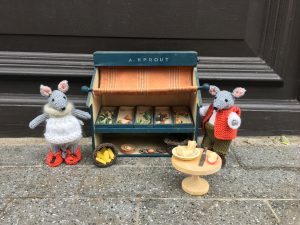 There will be more characters joining them in the next few weeks, look out for cheesemaking mice this week on Thursday 8th December and a sleepyhead bear in a onesie on 15th December! Dolores and Dave the Cheesemaker Mice. Debbie Bliss Originals.